Plants annual; often mat-forming. Culms 10-30 cm, decumbent and rooting at the lower nodes. Sheaths conspicuously and densely hairy, longer hairs 1.5-2.5 mm, papillose-based, shorter hairs about 0.5 mm, not papillose-based; ligules 1.5-2.5 mm; blades 2-9 cm long, 3-8 mm wide, conspicuously hairy on both surfaces, longer hairs 1.5-2.5 mm, papillose-based, shorter hairs about 0.5 mm, not papillose-based. Panicles with 2-9 spikelike primary branches, digitate or on rachises to 4 cm; primary branch axes 3-10 cm, wing-margined, wings wider than the midribs, lower and middle portions with spikelets in groups of 3; secondary branches rarely present; shortest pedicels 0.5-0.8 mm; midlength pedicels 1.5-2 mm; longest pedicels 3-3.5 mm, adnate to the branch axes basally. Spikelets homomorphic, 1.5-1.8 mm, lanceolate. Lower glumes absent; upper glumes 1/6-1/3 as long as the spikelets, margins and apices with appressed white hairs, hairs about 0.3 mm; lower lemmas 7-veined, veins equally spaced, appressed-pubescent between the inner lateral veins and on the margins, hairs 0.3-0.5 mm, minutely verrucose (use 50× magnification); upper lemmas yellow or tan at maturity. 2n = unknown. 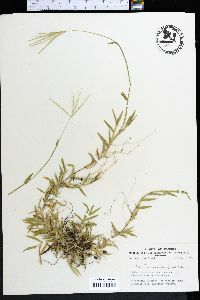 Digitaria serotina is native to the coastal plain of the southeastern United States. It has also been found in Cuba, possibly as an introduction, and on a ballast dump in Philadelphia, Pennsylvania. 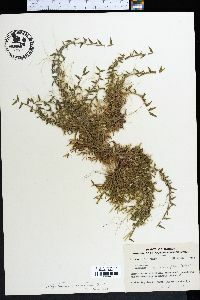 Its densely hairy sheath and short, densely hairy blades make this one of the more distinctive species of Digitaria in the Flora region. Much like no. 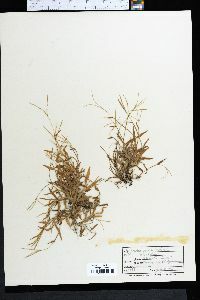 4 [Digitaria sanguinalis (L.) Scop. ]; lvs densely pilose; racemes 2-6, slender, often curved, 4-8 cm; pedicels terete, glabrous; spikelets 1.5-1.7 mm, villous with minute crooked hairs; first glume lacking, the second a third to half as long as the spikelet; sterile lemma 5-veined; fertile lemma stramineous or brown-tinged to nearly white. Waste ground; coastal plain from Fla. and La. (and Cuba) to se. Va., and rarely adventive northward.